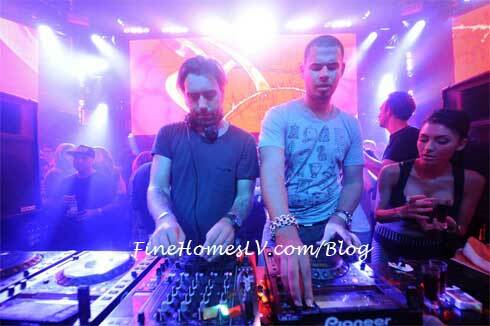 XS Nightclub Las Vegas closed the Labor Day holiday weekend with a night that will go down in history as the best names in electronic music collided under one roof on Monday. With Skrillex, Afrojack and R3HAB on the lineup, guest appearances were bound to happen once XS was named the official after party location for iDentity Electronic Music Festival. Clubgoers were in awe as the night included appearances from Deadmau5, Kaskade, Sebastian Ingrosso, AN21, will.i.am, NERO and Manufactured Superstars. The evening began with a special pre-shift pep talk from Afrojack as he thanked the XS staff for continuously providing a world class venue and revved up more than 100 employees for what would be one of the best Labor Day celebrations. R3HAB kicked off the holiday on the venue’s high-tech production, equipped with three video screens that wrapped around the entire backdrop of the stage. Anticipation began to build as R3HAB teased the crowd with Afrojack’s upcoming set by flashing videos above the DJ booth and handing out branded balloon sticks and glowsticks for fans to raise in the air. As Afrojack was escorted into the venue, like a fighter going into battle, he was surrounded by the gorgeous model staff all holding glow sticks high above their head. 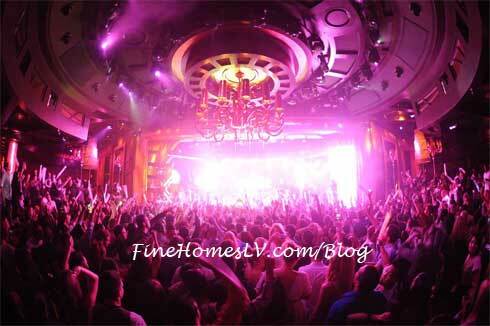 He took the stage shortly after 1 a.m. while a wave of excitement shook the dance floor as thousands of clubgoers simultaneously began to dance to the DJs signature tracks under a cloud of confetti cascading from the ceiling. 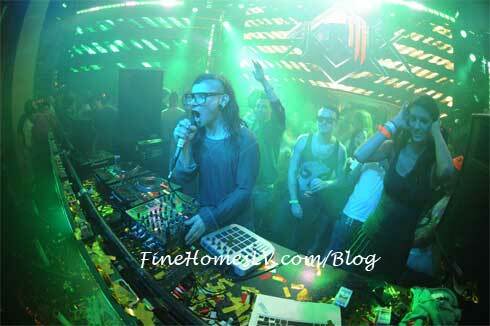 Skrillex, the emerging electronic visionary notable for his Dubstep style, followed Afrojack’s set providing a fresh compilation of beats for reveling fans. 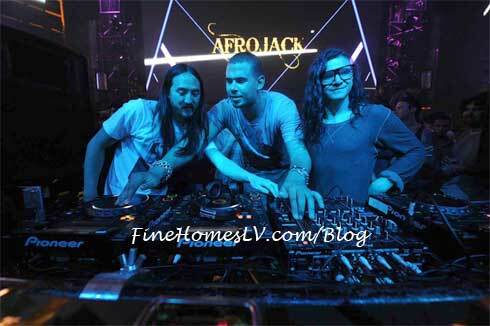 Shortly after taking the stage, Skrillex was joined again by Afrojack and surprises guest Steve Aoki for a one-of-a-kind set by all three talented artists. 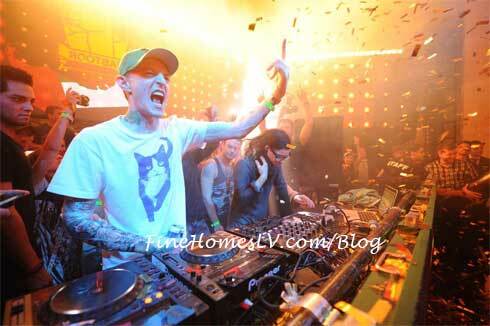 Immediately after, Deadmau5 climbed on stage to lend his talents to the evening’s soundtrack as well. XS Managing Partner Jesse Waits even got in on the action, taking a few seconds on the deck with Afrojack, Sebastian Ingrosso and R3HAB watching his skills. An explosion of screams erupted throughout the crowd as they witnessed this historic moment taking place before them. Deadmau5 was seen on stage into the early hours of the morning, hanging out with his girlfriend Lindsey Gayle and their close friend, PEEPSHOW star Holly Madison. He was showing off his latest ink that was completed just hours before. The innovative performer also announced earlier that day that he will be returning to the sophisticated nightclub for its Halloween weekend celebration with a special set on October 30. The night was still young as other notable musical talents poured into XS including The Swedish producer and DJ, Sebastian Ingrosso, AN21 who performed Saturday night as part of Steve Angello’s Size Matters party, the UK duo NERO, legendary artist Kaskade and XS Resident DJs Manufactured Superstars, proving XS is the favorite hot spot for electronic artists in Las Vegas, Nevada real estate.